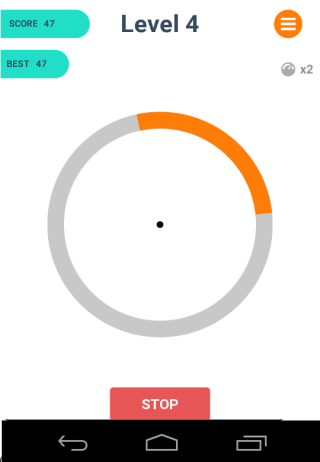 Time Ninja is a free Android arcade game to test concentration and anticipation skills. This game is quite different from other Android arcade games in which you have to run, tap, shoot, or match three same type of candies/diamonds, etc.. In this game, you are shown an arrow spinning around the screen. 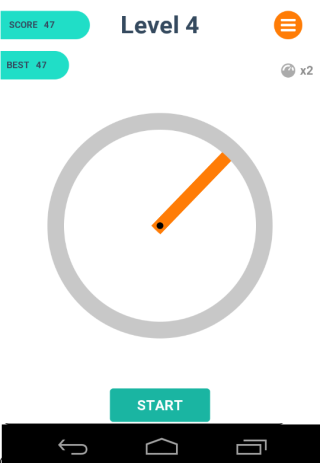 You have to analyse the speed of spinning arrow after which it disappears. 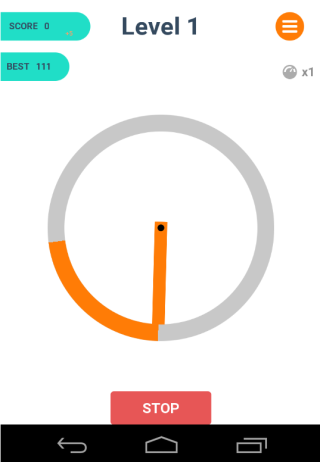 Now, you have to anticipate the position of the arrow to earn points. The position which you have to anticipate is given to you by the app. The game gets harder as you go on to clear levels with variation in speed and location to anticipate. When you launch the app, you will see the option for starting the game. Tap on it to launch the game. It will display a circle around which you will see a spinning arrow, or you can say stick. You have to concentrate and analyze the speed of this spinning arrow. When you have analyzed the speed, tap on Start option. This will make the spinning arrow invisible, but it will continue to move with the same speed. Just when the arrow becomes invisible, you will see a colored sector becoming highlighted on the screen. Now, you have to anticipate when this moving arrow will reach the highlighted sector. You have to tap on Stop option to mark your choice for the anticipated location of spinning arrow. You earn points on the basis of your anticipated location. You get more points if your anticipated location lies close to the center of the highlighted sector and you get fewer points if the anticipated location is around the corners of the sectors. To clear a level, you have to anticipate the location within the sector and there is only one chance to do it. If you anticipate the location outside the sector, then you will lose the game. The game goes on to become harder as you progress through the game, because of variation in speed of spinning arrow, location of the highlighted sector, etc..
You may also like: iPad Arcade Game to Test Concentration: Spin Bird. 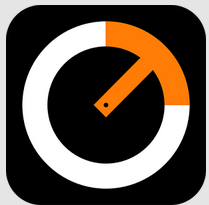 Time Ninja is a good Android arcade game which tests your concentration and anticipation skills. I liked the game, as its easy to understand and without too many complications. 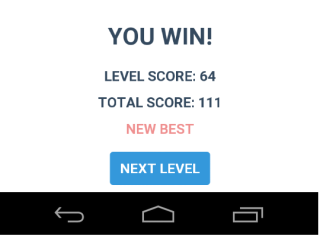 Its quite addictive and a good time killer game.